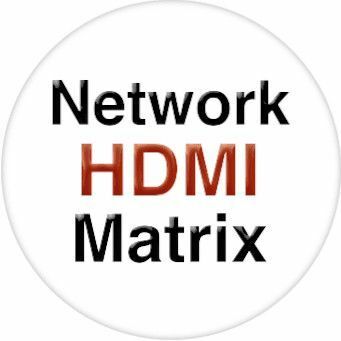 HDTV Supplys WolfPack 10x30 HDMI Matrix Over LAN is a simple to install & use many to many pre-configured HDMI matrix switch over a LAN. Because it is a matrix switcher, it allows any input to be routed to any output; or the same input to be routed to all outputs, or any combination. It is HDCP compliant and supports resolutions up to 1080p full HD. The HDMI Over IP Extender connects via an Ethernet switch to distribute & Extend an HDMI signal with the lowest bandwidth consumption (10Mbps/RX) so to minimize picture quality. It is controlled by a Web GUI Browser. The WolfPack HDMI Over IP Extender uses H.264 technology to provide high-definition & a vivid output image. This 10x30 HDMI Matrix Over LAN includes 10-SEND and 30-RECEIVE units plus AC adapters. One converts HDMI to the LAN and the another converts the LAN back to HDMI. The units also come with one set of IR send and receive control cables. The supplied remote control allows you to choose the source and the LED shows the group ID. Multiple receivers can simultaneously connect to many transmitters to form a WolfPack virtual matrix of up to 64 HDMI inputs with up to 253 HDMI receivers (widescreens). The Ethernet switch must have an IGMP function and we use the TP-LINK TL-SL3428. Other switches also may be used if they conform to a IGMP function. This HDMI Over Network Send and Receive Adapter taps into the benefits of Ethernet standards to overcome the inherent limitations of TMDS. The HDMI Over Network Adapter allows reliable cable runs up to 120m with easy splitting and distribution of HDMI audio and video signals with perfect signal integrity. This HDMI Over Network Adapter is compliant with HDCP specifications, supports copy protection with 128-bit AES encryption and overcomes traditional key verification limitations enabling very large system sizes while maintaining full HDCP compliance. And unlike first-generation Megabit implementations of IP technology, this HDMI Over Network Adapter means picture quality that is virtually indistinguishable from the source and suitable for the most discerning viewer. Why not buy this 10x30 HDMI Matrix Over LAN today? The HDMI Over IP Extender allows you to simultaneously send out an HDMI 1.3 signal with 1080p video and 5.1 audio to one or more HDMI video projectors or widescreens and return an IR control signal to the source using a CAT5/6/7 Cable over a standard Ethernet infrastructure. Many A/V surround sound receivers with HDMI switching that include the proper chip set. Call your AV receiver supplier to discuss your application or us. Q: What is a managed network? A: In typical SNMP use, one or more administrative computers called managers have the task of monitoring or managing a group of hosts or devices on a computer network. Each managed system executes, at all times, a software component called an agent which reports information via SNMP to the manager. HDTV Supply includes a 1 Year Limited U.S. Warranty on this 10x30 HDMI Over LAN. The U.S. warranty states that (a) its products will perform substantially in accordance with the accompanying written materials for a period of 1 year from the date of receipt & (b) that the 10x30 HDMI Over LAN will be free from defects in materials & workmanship under normal use & service for a period of 1 year. In order to get a warranty replacement for a defective item, HDTV Supplys Support Team will verify the product is eligible for warranty. An RMA number will then be issued. Shipped replacements will be in like new conditions, tested & all HDMI Over Network Adapter components included. A 30-day RETURN also comes with this warranty as well as Free Lifetime Tech Support. HDTV Supply also sells a 3 and 5 Year Extended U.S. Warranty for this HDMI Over Network Adapter. Please go to Extended Warranties or see the above Options to purchase it.